Jonathan Wenger established his first farm straight out of high school. Nowadays, the newly named “Lettuce Boy Farms” specializes in salad-type crops like lettuces and root vegetables. A true family farm, Jonathan is helped by his parents (and occasionally his brother) tending to the day to day work at Lettuce Boy. All crops are grown without pesticides or synthetic materials, they partner with a neighboring farm to make compost from manure, and natural material like crushed rock powder is used to help with soil maintenance. This week, I spoke with Jonathan to learn more about the delicious radishes you will be receiving in your bin this week! In contrast to the 70 day tomatoes we learned about last week, radishes have an extremely short growing season. According to Jonathan, in ideal weather they only take about three weeks to grow, and the radishes you will be receiving were planted five weeks ago in April. From Dave at Ingraberg, we learned about heat units and growing time, and Jonathan pointed out that the amount of daylight is also an important factor in growing plants. Radishes typically like a cool and moist environment, and the rainy days we had in April (who can forget them?) kept the plants so well-watered, Jonathan said he barely had to help them out. Jonathan attests that radishes are a pretty simple crop to grow, however, they provide a large array of health benefits. In traditional Asian medicine, radishes were used to cure illnesses like whooping cough, cancer, gastric problems, constipation, arthritis and parasites. They are low in calories, and high in dietary fiber, vitamin C, folate (which helps to create DNA and RNA) and potassium. Perhaps the biggest health benefit radishes provide are antioxidants along with folate, which have the potential to protect against cancer and heart disease. ps. Don’t peel them! 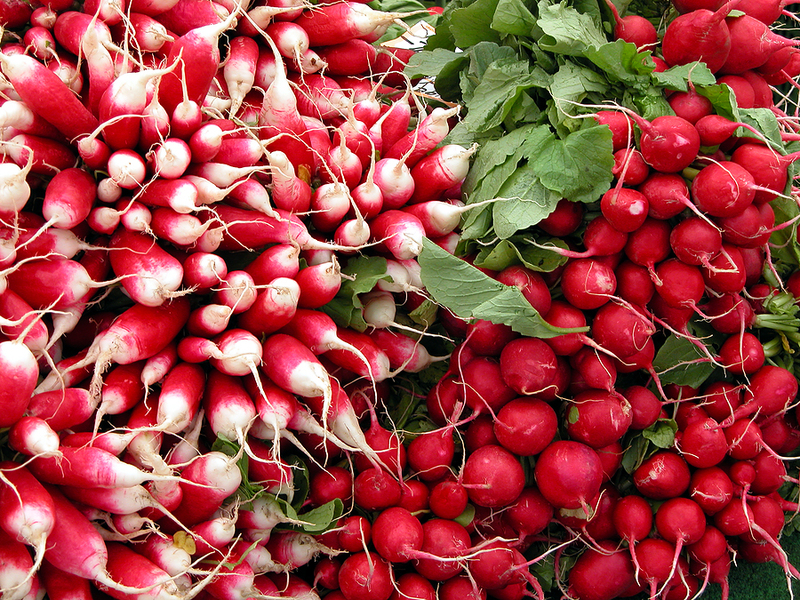 the flavor and health benefits of radishes lie in their beautifully colored skins. Radishes are commonly seen sliced in salads, or intricately carved to adorn buffets. Now that we know all the health benefits that radishes can provide for us, it’s time to think of them as more than just a garnish. So, we promised it, and here it is! A lovely radish recipe that came highly recommended from Farmer Jonathon himself, enjoy! 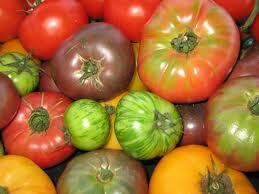 Come back next week for more local food news from the Doorganics blog! Cut off and discard root end of bok choy, leaving stalks with leaves. Cut green leaves from stalks. Cut leaves into 1-in. 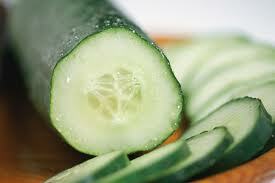 slices; set aside. Cut white stalks into 1-in. pieces. Thinly slice radishes and shallot. In a large skillet, cook bok choy stalks in butter and oil for 3-5 minutes or until crisp-tender. Add the radishes, shallot, lemon-pepper, salt and reserved leaves; cook and stir for 3 minutes or until heated through. Serve as a side to your favorite springtime meal! Nutritional Facts: 3/4 cup equals 59 calories, 5 g fat (2 g saturated fat), 8 mg cholesterol, 371 mg sodium, 3 g carbohydrate, 1 g fiber, 2 g protein. Also visit – loveradish.co.uk for this twist on a radish salad, the Grilled Radish, Fennel, and Asparagus salad with a caper dressing! Radish Health Information: Palmer, Sharon. 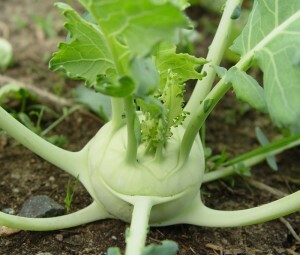 “Radishes, spring’s favorite vegetable.” Environmental Nutrition Apr. 2010: 8. Academic OneFile. Web. 27 May 2013. 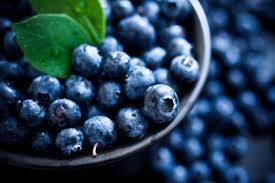 Blueberries: A Fountain of Youth?